In an age where rampant consumerism often feels like the norm and people seem more disconnected to one another than other, it is refreshing that there is a movement behind reconnecting with our communities and thinking of others’ needs. And while it is exhausting and often exasperating that there is a Day for every little thing - one that is devoted to charitable giving or connecting with our communities in meaningful ways is something I can get behind. But, beyond Giving Tuesday, I encourage you to consider ways in which you might give back on other days of the year. It could be as simple as asking for donations to your favorite charity for the holidays or your birthday in lieu of gifts, or gathering friends and loved ones for a weekend of volunteering in your community - at your community garden, cleaning kennels at your local animal shelter, or cooking meals for the food insecure, the opportunities to give are endless. If you plan on donating this Giving Tuesday, please be sure you are donating to a reputable organization has a real positive impact. So many donations are not used effectively, and some organizations are not implementing change in ways that are necessarily helpful to the communities in which they work. How Do I Know My Money Will Be Put to Good Use? Give Well is a great website to utilize if you want to donate somewhere, but aren’t really sure to where. Put simply, Give Well helps donors decide where to give by identifying top charities working in global health and development, which they assess along four criteria: their evidence of effectiveness, cost-effectiveness, transparency, and room for more funding. They focus on providing donors with a small list of what they consider to be outstanding charities, rather than providing an exhaustive list of as many charities as possible. This is another reason why I think Give Well might appeal to someone who isn’t sure of where to start - the smaller number of recommendations can feel less daunting, yet donors can rest assured that any charity they choose is excellent. For a more comprehensive list of charities, or to find information on a charity you’re interested in donating to, use platforms like Charity Navigator or the BBB Wise Giving Alliance. Both websites are intuitive, easy to use, and allow users to simply type any charity directly into their search. If the charity is in the database, they will appear in the search, along with their description, and rating across a broad range of criteria. Users can also search their database of charitable organizations alphabetically, by category (human health, environmental, animal welfare etc) , and even by scope (regional, national, or international). Please note that the lack of a rating does not necessarily mean the charity is not reputable. It might mean that the organization has not responded to inquiries. In that case, it’s best to go directly to the charity to ask questions, or look to see if their website provides transparency and data on the effectiveness of their programs and exactly how donations are used. There are a few charities that I like to donate to, and one that I make regular monthly donations to all year. One-time giving is wonderful, but monthly giving (even in small amounts spread out over 12 months!) helps charities better plan their budgets and set fundraising goals for the year. IAR is a powerhouse animal rescue organization that saves animals who are suffering, but also rehabilitate and release them back into the wild and works to protect their natural habitats. They work around the world, actively engage within the communities they work to provide education on the humane and compassionate treatment of animals , and also with governments to implement and strengthen legislation to protect animals. Most notably, they do very important work at their orangutan rescue center in Indonesia, where they are regularly rescuing and rehabilitating orangutans who are the victims of deforestation due to the palm oil industry and the illegal pet trade. 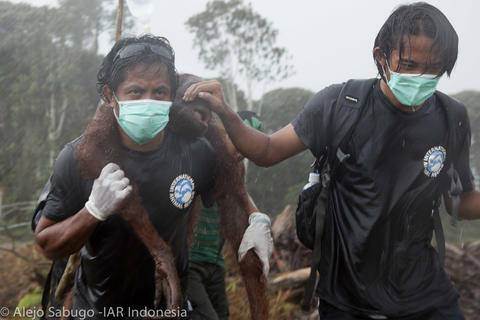 In addition, their Human Orangutan Conflict team comes to the aid of orangutans who are left stranded when their forest home is destroyed, and help to translocate them to safe and protected areas of the forest. If you ever want a good happy-ugly cry, please watch a video of one of their rehabilitated orangutans being released back into the wild. They also do work rescuing captive dancing bears in Armenia, with howler monkeys in Costa Rica , in addition to numerous other rescues. The incomparable and inspiring marine biologist Dr. Sylvia Earle, along with her team at Mission Blue, are educating the public and raising awareness about our oceans’ “Hope Spots.” These spots are vital to the health of the ocean for a number of reasons, and either need designated protection, or are current marine protected areas (MPA’s) that need more action. These areas might be considered Hope Spots because they are a site with the potential to reverse damage due to human impacts; have a special abundance or diversity of species, unusual species, habitats or ecosystems; or is the presence of a major migration corridor or spawning grounds, among other criteria. With less than 6% of our oceans protected, it is the goal of Mission Blue to ignite a wave of interest in ocean conservation, and expand protections to one of the most vital eco systems on the planet. Your donation to Mission Blue will go to supporting all Hope Spots, or you can elect to support a particular Hope Spot that is important to you. Supporting Planned Parenthood is always important, but with women’s reproductive rights under constant threat by the current administration, PP needs our support now more than ever before. In fact, the PP website provides information outlining the impacts of proposed rules and regulations surrounding our health care. Among the safe abortion services they provide, PP offers family planning services, free and reduced fee birth control, cancer screenings, wellness checks, among other important services vital to the health of individuals, families, and their communities. Unable to make a financial donation but still want to give? Donate to your local shelters, food banks, or animal rescues. Whether you have time to donate at any of these places by offering your skills or services, or if you have items at home to give - blankets for homeless shelters, pet beds or food for animal rescues, or warm winter coats to give to a local coat drive that you know will go directly to someone in need- giving doesn’t have to be in the form of a monetary donation. Most local food banks , homeless shelters, or animal rescues could always use help or have a living list of items they are always in need of. Just make a phone call or check their websites. No matter how you give, even if it’s just paying forward a small act of kindness, I think you’ll find that it is more fulfilling in ways that buying things won’t ever satisfy.